The Caddis Fly Angling Shop presents the Third Annual McKenzie River Two-Fly Tournament, September 24-25. Teams of two anglers will compete for thousands of dollars in prizes, fishing from McKenzie Drift boats rowed by expert guides. 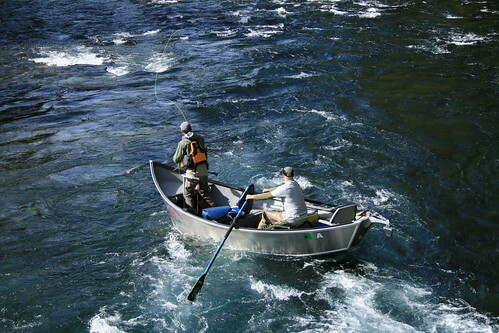 This fun competition restricts anglers to fish with only two-flies for the entire day, during some of the McKenzie River’s best fishing of the year. 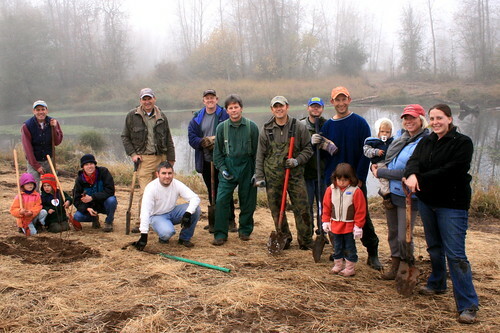 Over the past two years we’ve raised nearly $7,000 to restore native coldwater fish habitat at McKenzie River Trust’s Green Island property on the confluence of the McKenzie and Willamette Rivers. The funds helped reconnect an historic side-channel to the river, increasing habitat for Spring Chinook and Cutthroat Trout in the winter, and decreasing habitat for non-native, predatory fish in the summer. We’ve also helped fund the removal of a levee and road along a side-channel in the north portion of the property. The structure was built in the 70’s and restricts natural floodplain activity during flood events. The side channel along this levee has been identified as having much colder water than the mainstem river, and during the summer months this habitat is home to 100% native coldwater fish species. This year we will be funding a channel reconnection at the middle of Green Island (Willamette side channel to McKenzie channel). Festivities begin Friday night, September 24th at the Caddis Fly Shop in Eugene for beer, wine and appetizers, and a presentation on fly fishing the McKenzie River by Chris Daughters, and a discussion from McKenzie River Trust on the significance of the habitat restoration taking place on the confluence of the McKenzie and Willamette Rivers. Saturday morning fishing begins, anglers pick two flies at the start of the day which are photographed. If anglers lose their two flies they no longer participate in the tournament, but can fish for fun the rest of the day. This year there is an additional twist: Anglers have an opportunity to buy an extra fly this year for $100 that goes to the cause. Teams of two compete for the three largest fish, measured against official ODFW-standard rulers and photographed with digital cameras in the measuring device. 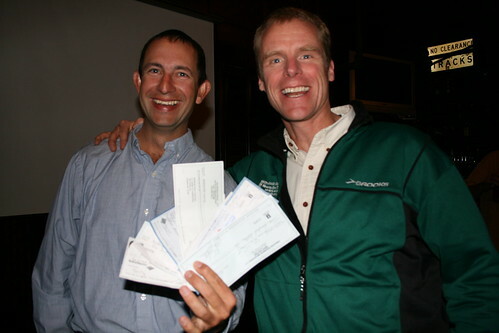 The awards banquet is held immediately following the fishing at the Oregon Electric Station. This year we’re featuring great prizes from Simms, Stonefly Studios and Anglers Book Supply. Tournament entry fee is $350 per person and includes a full day’s fishing, food and drinks Friday and Saturday. 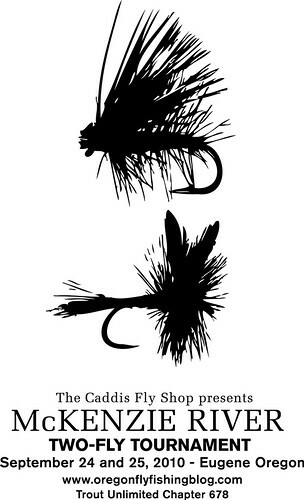 But we have a very limited number of seats due to repeat participation, so if you would like to participate this year, you need to get a check to the Caddis Fly Shop ASAP. Call for details 541-342-7005.
what section are you folks floating, and if I sign up, can I pick the run? IE :Put-in/Takeout. Hey Steve, we chase wild fish — so the guides float the non-stocked sections of river — about half the boats put in above Blue River, the other half below Leaburg. Last year the lower river won it, with 54″ total coming from Jeff Carr — 20″-18″-16″ wild redside rainbows. Oh, and no, you can’t pick what section you float. The guides know what section they’re floating beforehand, and participants draw guides at the Friday night event. Matt, I’m doing Greenwood to town of Leaburg. My 2 flies will be a Silver Hilton and a MOAL. No guide necessary. Just give me the go ahead and I’m in. This is a great event… I highly suggest anyone interested in good food, great fishing, cold beer, and helping a fantastic organization like the McKenzie River Trust – enter this immediately. Cory’s got it figured out. His first fish will be 27″, his second 26″. There are still lots of hatchery steelhead to be killed and grilled. resident trout are the only fish that score. Congrats to two local Damsel Flies, Joan McCreery and Darlene Kline-Dolby for winning this year’s 2 Fly Tournament. But it couldn’t have been done with out the coaching and expert boating skills of their guide, Ty. The three of you made a good team and your efforts were rewarded! The last fish was for Rick…..Joan’s lucky charm!